Wouldn’t it be great if there was a way to easily start a fire every time with less smoke? It’s possible, but you will have to discard your previous experience and approach this new method with an open mind. Most people learned the old ‘log cabin’ style of building a fire with the smallest kindling at the bottom. You are about to learn the top-down method, which is exactly the opposite of what you were taught. 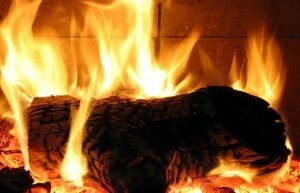 The top-down method works equally well in wood stoves, fireplaces and masonry heaters. In fact, the technique has been in use for hundreds of years with the large masonry heaters found all over Europe. It works just as well today as it did then. Start by placing the largest pieces of wood in the bottom of the fireplace or wood stove, with the ends at the front and back. Some wood stoves will have a deeper or wider firebox and this will certainly be a consideration when you’re cutting wood. Placing the wood with the ends at the front and back allows air to mix well with the fuel instead of only hitting the broad side of the wood as it would if it were placed parallel to the opening. Some wood burners prefer to use hardwood for the bottom row and softer (though no less dry) wood near the top of their firebox. The real key is to make the kindling small enough to easily ignite on top of the pile. All of the wood should be dry, but this is especially critical of the wood at the top. Once you have placed the bottom row, stack 4-5 smaller levels of wood on top of the first layer until your wood is stacked to about 1/2 of the height of the fireplace. At this point you will begin placing your kindling (the smallest pieces of wood). Again stack smaller and smaller pieces until there are simple wood shavings on top. If you wish to cheat a little you can place a crumpled piece of newspaper on top. In any case, the stack should not go above the fireplace opening. The shavings at the top should be small enough to light with a single match. As the fire burns from the top to bottom, it will continue to ignite the wood below. This method is a “light it and you’re done” procedure. No more fiddling with larger pieces of wood falling on the struggling new fire. Notably, only a little smoke is created as the fire burns cleanly from the top of the stack. This brightly burning fire makes it less likely that the fireplace will smoke as it heats the chimney without the interference of loads of wood resting on top of it. Used with permission from the Chimney Safety Institute of America at www.CSIA.org.